This could be used to take the guesswork out of trading — potentially handing you the precise moments to buy and sell... for long-term gains as high as 1,616% over and over. Right Now I’m going to introduce you to a true breakthrough. It’s my simple, proprietary timing indicator that even a 6-year old child could instantly spot. And third, you could make up to 16x your money in a way that can be safer than how most people trade stocks. To prove how simple it is to make money using this technique, I’m going to show you three stock charts based on series of winning back-tested trade examples right now. It’s tough to know when to buy or sell. Is AEM a good trade or a bad one? The Kissinger Cross tells you exactly when to strike. The play went on to make 42% or annualized gains of 184%. When most people look at this stock chart, this is how they see it. In just a simple glance you know exactly when to jump in. 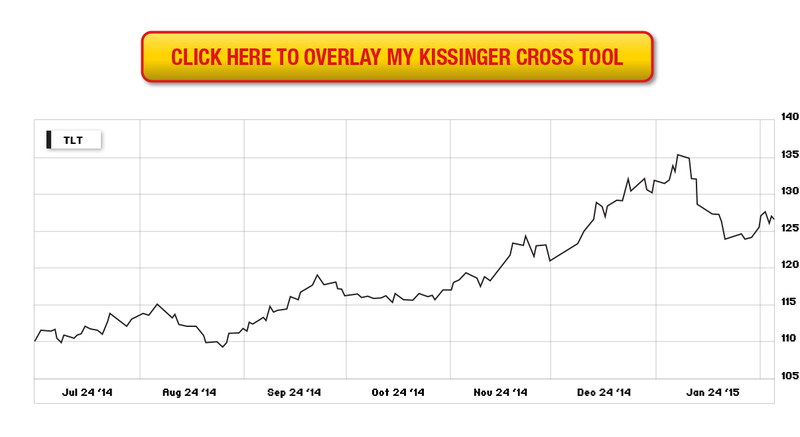 Buy at the Kissinger Cross and you could have turned every $1000 into $1,500. In at $22. Out at $26. Simply from spotting the Kissinger Cross. Why have you not heard about this before? Because this cross is the result of a proven formula that has been used almost exclusively by the highest-ranking government officials. And when used properly this same formula has been used to end WWII… to locate crashed commercial airliners… to predict a space shuttle disaster beforehand… and much, much more. In fact, I’ve personally used a math formula behind the Kissinger Cross to successfully predict terrorist attacks for the CIA and department of defense (and yes, those attacks were avoided). But there are two critically important things you need to know right now. First, as far as I know, no one's ever used this magic mathematical formula to predict financial markets before now. Mark my words: This is unlike anything you’ve ever seen. 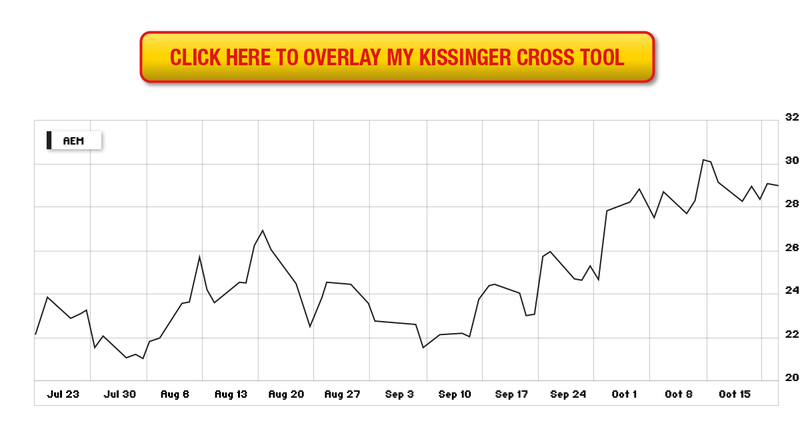 And second, I’m looking for just 200 people to learn how to put these Kissinger Crosses to work in the markets today. I’ll share more on the exact reasons behind our strict limit in just a moment. 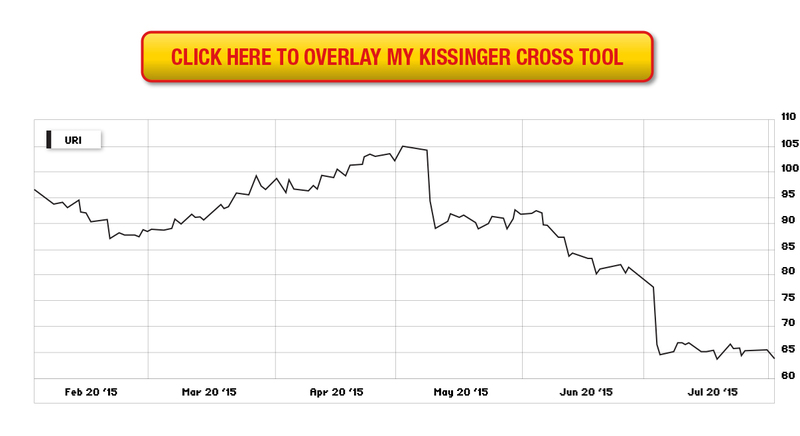 The Kissinger Cross is so simple that any investor -- from someone starting today to a seasoned trader -- should use it. That’s what I’m going to show you right now. I’m going to show you everything you need to know to start using this Kissinger Cross technique today. But you need to get all of this information right now. That’s because we may be forced to remove this from the internet at any moment. See, more than nine investment firms have tried to get their hands on the Kissinger Cross secret, including bankers at CitiGroup. And in recent weeks, the owner of a Boston-based brokerage firm (with over 200 clients) paid me a lot of money to try to obtain this secret for him and his clients. This method is in high demand. You can use it if you’re near retirement… or far from it. And you can use it no matter what amount of money you have to start -- be it $500 or $5 million. 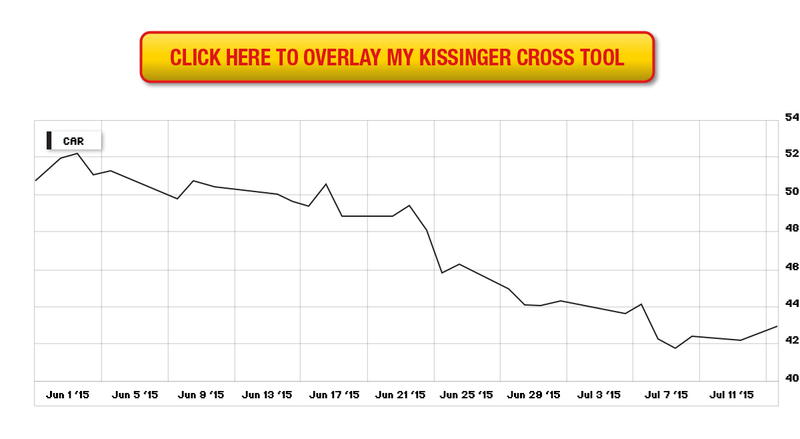 All you need to do is follow the exact Kissinger Cross moments I lay right at your feet. Take a company named Check Point Software Technologies, for example. The company is a cyber security contractor. Because of my close work as an advisor to the U.S. government… I’ve known America is at risk of cyberattacks from countries like China. For the past two years the company has done well as government and U.S. business looks for cyber protection. In fact, if you had simply bought the stock and held over the past two years, you’d be up 26%. That means every $10,000 would have turned into $12,600. But unless you’re an advisor with deep government connections and top-secret clearances, you wouldn’t specifically know when to buy or when to sell. Looks like a normal chart, right? Lots of ups and downs. You see with perfect clarity exactly where to time your buy. 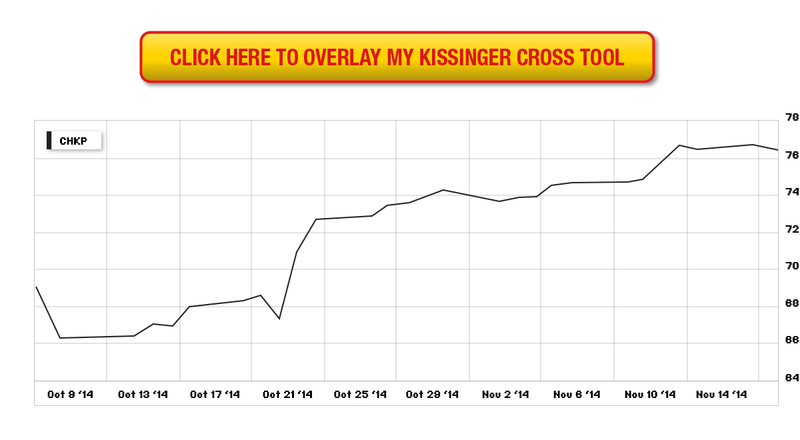 On October 15, 2014, my overlay spotted a Kissinger Cross. This indicates that CHKP was a “buy”. 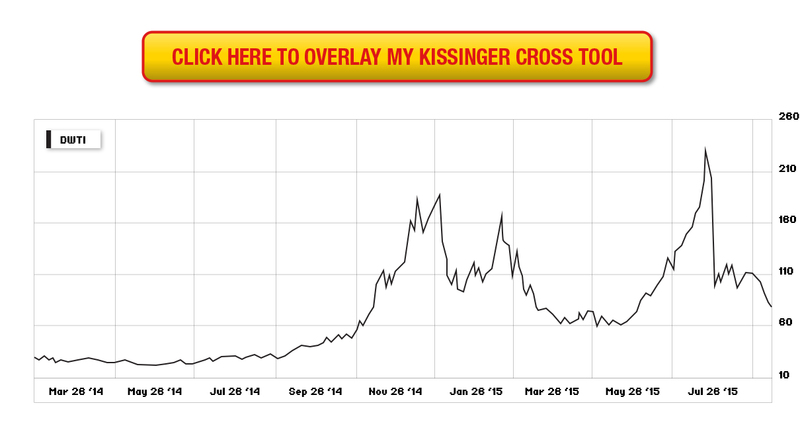 On November 17, 2014 the overlay flashed another Kissinger Cross. This one told us it was time to sell. But had you followed those two simple Kissinger crosses in the way I recommend… you could’ve grabbed 670% gains in less than one month. That turns every $10,000 invested into $67,100. And that’s more than 47 times the gains you would have seen by simply buying and holding the stock. Because there are plenty more examples of how the Kissinger Cross can work, too. Including three plays you can make -- today, right now -- to begin to build your own wealth. These plays have just triggered within the last 24 hours. I’ll give you detail on all three of these plays in a moment. I’ll show you how much you could make, and how to buy them as soon as 5 minutes from now. Think of these first three plays as your fast-track for potentially getting all the money you could ever want in life. Everything that comes afterwards will be the proverbial icing on the cake. Know Precisely When To Get In. Know Exactly When To Cash Out. Most people think that you cannot time the market. 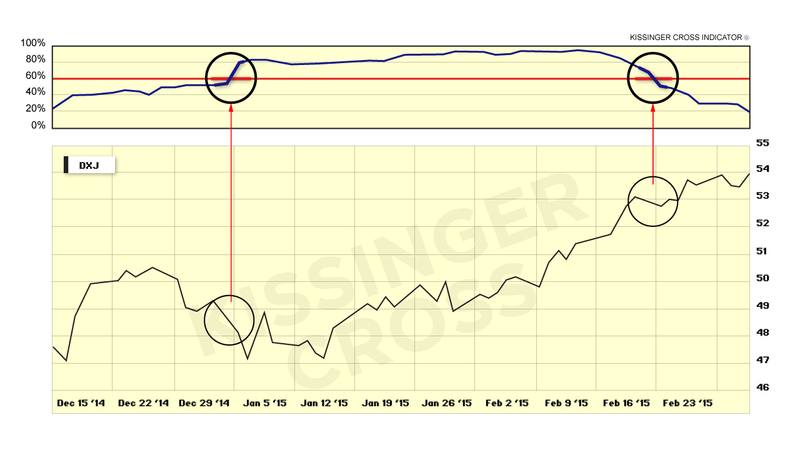 But the Kissinger Cross is hands down the closest thing I’ve seen for finding the exact moment to enter and exit a trade. I told you, it’s a complete trading breakthrough. This is the stock chart of an exchange traded fund call TLT. In this example you would have seen 1519% in just three months. That turns every $10,000 into $151,900. True, huge winners like this are rare. 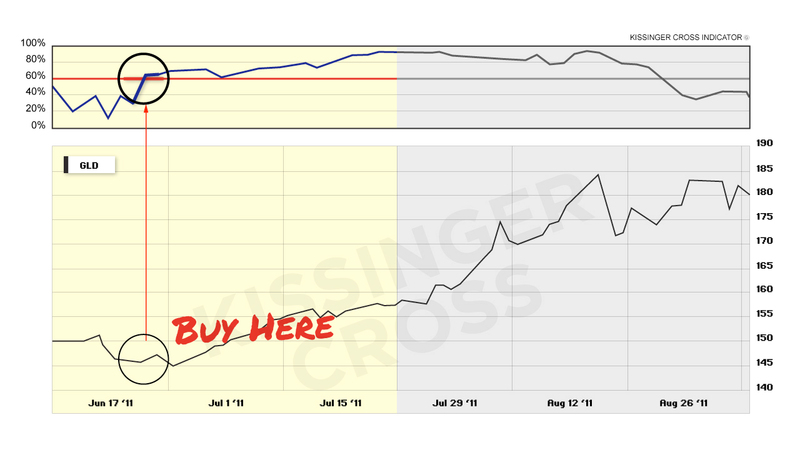 And not every trade will be a success, but it’s the perfect demonstration of the investing power that The Kissinger Cross indicator can unlock for you. 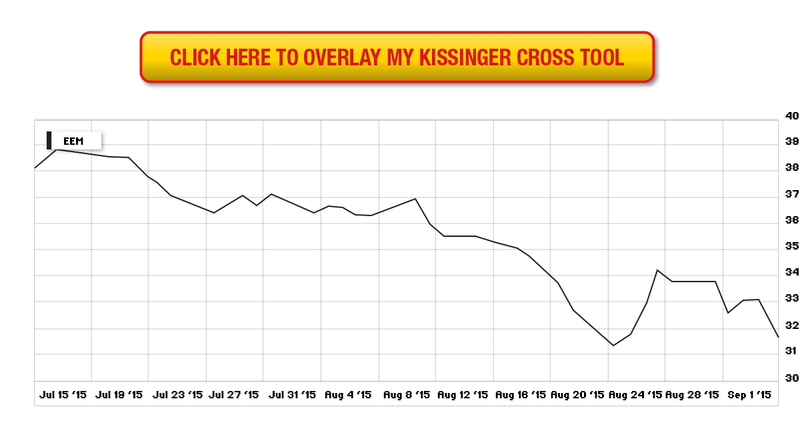 You’re going to want to put The Kissinger Cross to work for youright away. And let me just say, using The Kissinger Cross on your own isn’t difficult. I’ll show you how today. This time we’re looking at a chart of DWTI. You buy it like any other stock in your brokerage account. Except it’s special. It goes up by $3 every time the price of oil goes down by $1. If you know that the price of oil is about to drop… buying DWTI is the way to make money. But when should you time your buy? There are lots of little up and downs, right? See what happened there on June 2, 2015? The first Kissinger Cross flashed. At the time oil was still at $66 a barrel. It was the time to buy DWTI. Over the next few months… the price of oil dropped to $43 per barrel. That’s a 34% drop. But because DWTI is an inverse oil fund, it shoots through the roof when the price of oil drops. And that’s what happened. 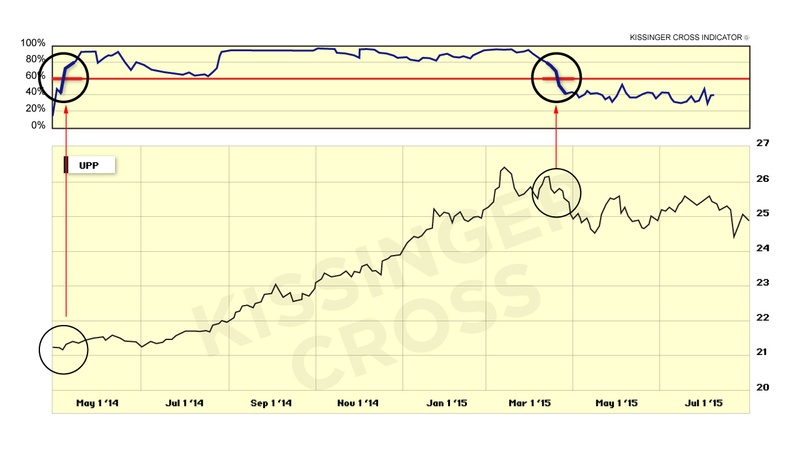 Until on August 24, 2015, the second Kissinger Cross flashed. If you had sold where the tool indicated, you would’ve captured gains of 208% in just 2 months. That’s an annualized gain of 1,248%! That’s amazing. I did not invent this criss-cross pattern. And I can’t take credit for it. It was taught to me by America’s most controversial security advisor -- Henry Kissinger. Kissinger had left his posts as the Secretary of State and National Security Advisor. At a private luncheon, he agreed to teach his best secrets to small group of up and comers in the intelligence field. As a recent graduate from Johns Hopkins’ School of Advanced International Studies, I was lucky enough to be in that room. The #1 secret Henry Kissinger shared that day was...you guessed it...the theory behind what I now call the Kissinger Cross. Imagine for a moment the famous story of how Navy SEAL Team Six killed Osama Bin Laden. If the SEAL team acted too early, without enough information… they could have ended up raiding the wrong location. And if they waited for enough information to be 100% certain, Bin Laden could have moved. An intelligence cross is a green light telling you to take action. It’s the cross-section where you have enough good information to be smart AND still have time to effectively act. 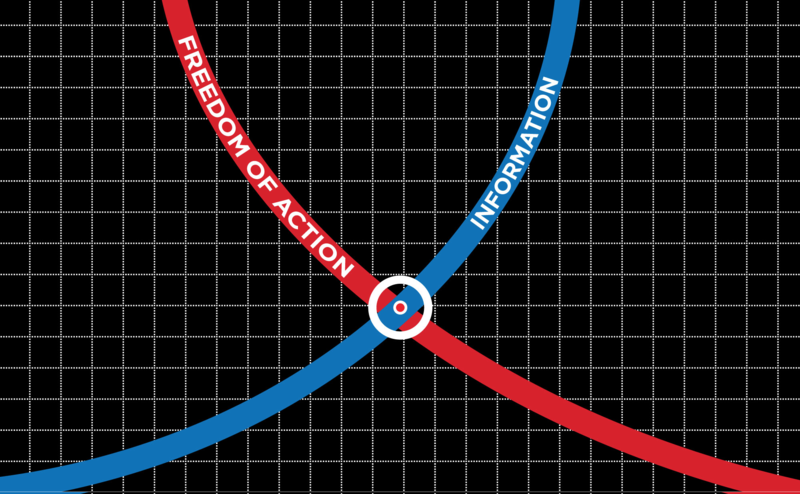 It's the perfect strike point of information and time. And it’s exactly the kind of tactic the SEALs used to accurately strike and take out America’s most feared enemy. It’s no exaggeration to say that the theory behind the Kissinger Cross has been saving lives since 1941. The formula behind the Kissinger Cross won WWII for the Allies. I’ve personally used this cross moment in the intelligence community to help the U.S. government prevent terrorist attacks. For more than 34 years I kept this secret to myself… and used it to build my career in law... in finance... and in my government intelligence work. I’m finally ready to share it with serious readers like you. Take the chart of a fund with the ticker symbol: GLD. It’s another display of the Kissinger Cross indicator’s power. GLD is the popular investment that tracks gold. 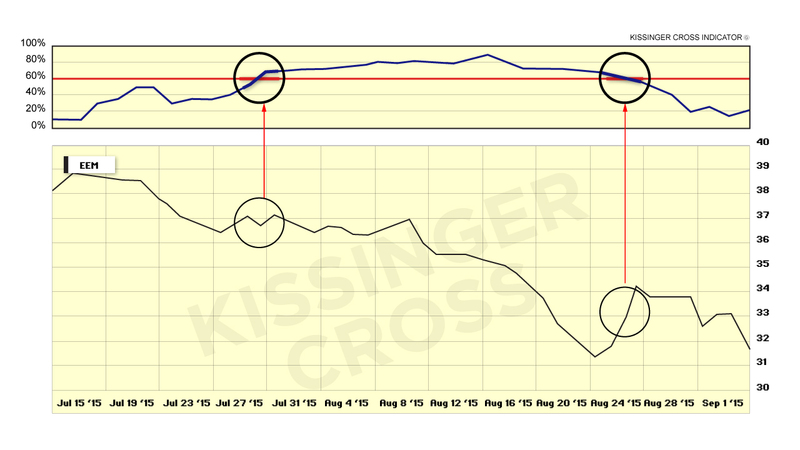 On July 1, 2011 the first Kissinger Cross flashed “buy”, right as GLD was bottoming out. Over the next three months, GLD rose by 22%. Until this world's only tool flashed “sell” on September 1, 2011. Now, that’s a nice return. 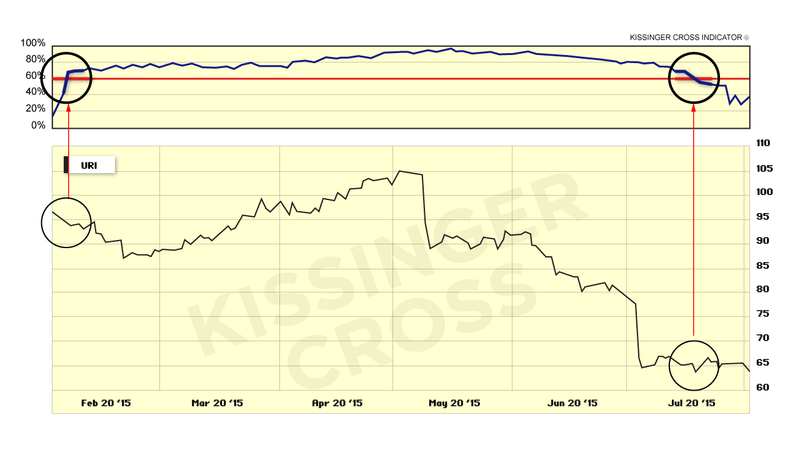 But had you used the specific type of investment strategy that the Kissinger Cross works best with, you could have instead made a huge 9,194% return… in the same three-month period. That’s enough to turn a modest $5,000 investment into more than $459,700 in pure profit. Double your starting capital, and now you’re close to collecting a cool million in profit. Of course, back testing is one thing. And no investment strategy is foolproof or guaranteed to return these kinds of profits. 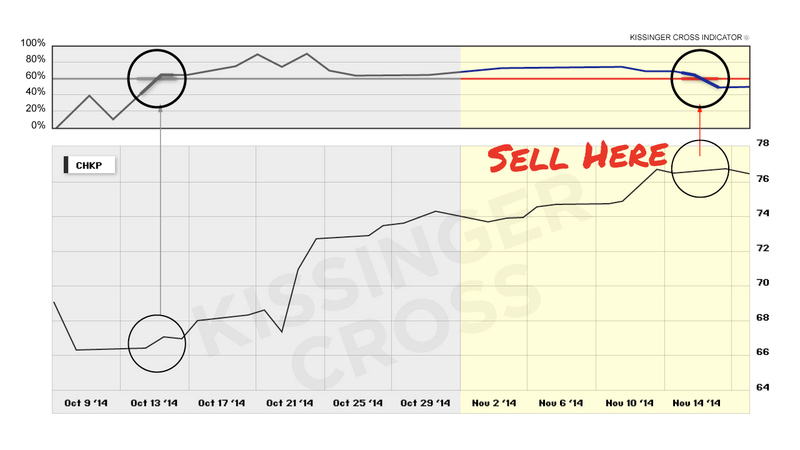 I wanted to know if The “Kissinger Cross” could spot these trading recommendations in REAL-TIME. When a Kissinger Cross flashed, I sent them out urgent buy instructions. When it was time to get out, I sent out sell instructions. 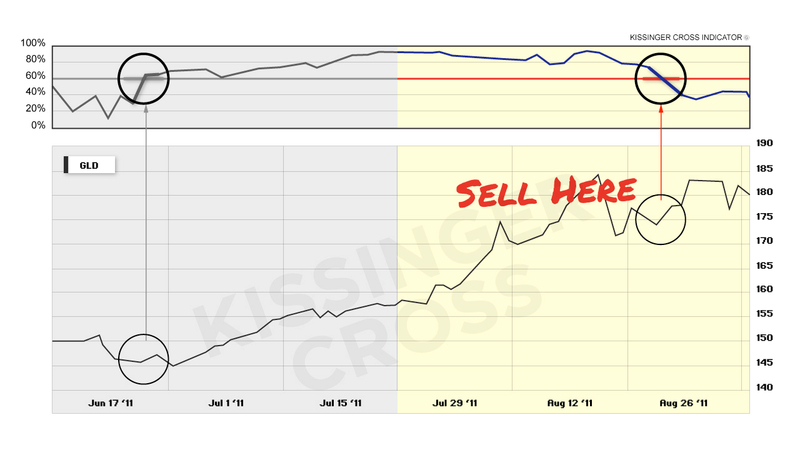 Would I succeed in my mission of showing readers how to rake in short term profits using this breakthrough cross moment as a buy and sell signal? Take United Rentals Inc. (URI). URI rents equipment to oil drillers. Since crude oil prices fell in 2014, I had a hypothesis that spillover effects would impact other industries closely connected to the oil sector. Then, on February 24, Kissinger’s Cross flashed on my screen. A downside trade was triggered. We had enough information that URI would soon fall and still plenty of time to act before the profit opportunity was gone. I emailed readers right away with urgent instructions. I recommended they buy a specific type of investment that goes UP when URI goes DOWN. Shooting my recommendation straight to the moon. Remember, this was a REAL-TIME trading recommendation. I wasted no time emailing readers -- telling them to book 162% profits thanks to the method. That’s the ticker symbol for Avis Budget Group, the car rental company. On Jun. 16, 2015, my formula produced a clear Kissinger Cross that indicated CAR was set to crash. Again, this was a real trade that I recommended to my readers. I immediately gave my readers very specific instructions on how to profit when it did. All they had to do was follow those simple directions… then wait for the second Kissinger Cross to appear. 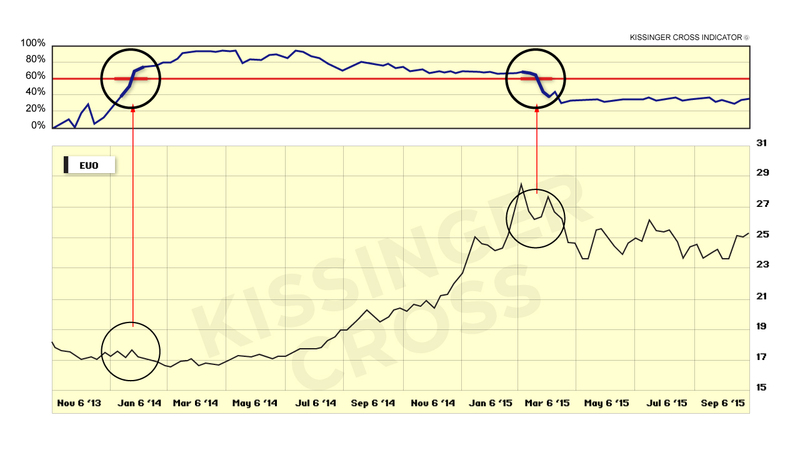 They didn’t wait long -- the second Kissinger Cross flashed again on July 10. We rushed out an email to readers recommending they sell their investment for a return of 150% in under a month. That’s an annualized return of 1,800%! The Kissinger Cross flashed again just days later. This time it flashed a crash in the Emerging Markets. You could have made 841% in a month on EEM -- a popular Emerging Markets ETF. 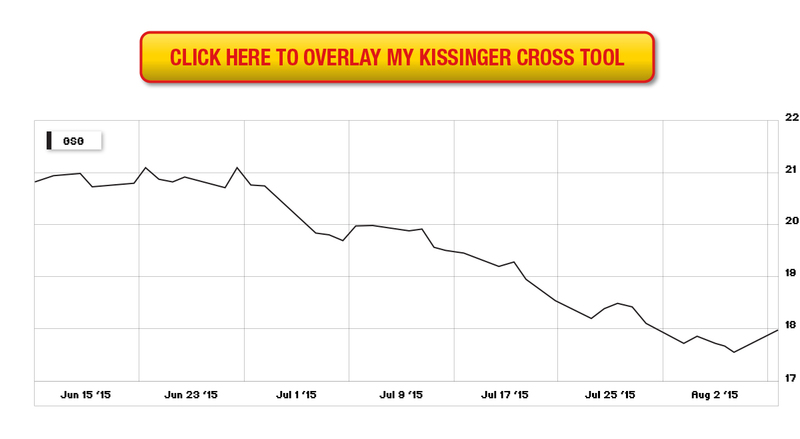 The first Kissinger Cross shoed up on July 30, 2015 -- your trigger to enter the trade. Then on August 28, 2015 -- your received your trigger to exit the trade. Enjoy triple and quadruple digit returns. That’s the potential of this indicator. Gains of 230% were possible. You would’ve entered the trade at the first intersection on June 29th… and exited a month and a day later on July 30, giving you whopping annualized gains of 2,760%! Using a math formula that predicts outcomes based on time and information. Right now I’m going to show you a sneak peak at that math formula. I’ll also show how I’ve specially designed this strategy to give you limited risk but unlimited gains. Then I’ll show you how to get your hands on the three REAL TIME Kissinger Crosses that have just triggered -- each one with the potential to hand you quick strike gains. This equation is called “Bayes Theorem” by mathematicians. It was discovered in 1763 by Reverend Thomas Bayes. And it’s worked for two centuries. In fact, it’s been used by men like Henry Kissinger in secret government work for decades. This formula can be applied to almost anything: Stopping terrorist plots… finding lost airliners… and now, picking the right investments. It looks intimidating, but anyone can understand what it says. And don’t worry. You do NOT need to remember this to use Kissinger Crosses. In fact, I’ve figured out a way to simplify the process for you. The left-hand side of the equation,P(C|E),you make some educated hypothesis we have using the best information available. Then, you assign a percentage of likelihood that result. This can vary from 50% (really just a best guess) to 95% (a strong thesis). Then, you enter data into the top part of the right-hand side of the equation,P(E|C) Pprior(C).that would be likely to appear only if the thesis is valid. On the bottom right-hand side –ΣP(E|C’) Pprior(C’) – you enter data that includes results different from the one you’re expecting to happen. As the numerator grows, the probability of your hypothesis being correct goes up. As soon as the equation spits out a result above a 60%... the first Kissinger Cross flashes showing you the odds are in your favor, and to buy. Then, you keep plugging the data into the equation. When the equation gives you a result below 60%, the second Kissinger Cross flashes again - telling you the odds have fallen out of your favor, and to sell. But earlier I mentioned an important “tweak” I made to this strategy. One that gives you unlimited upside potential but always known and strictly limited risk. 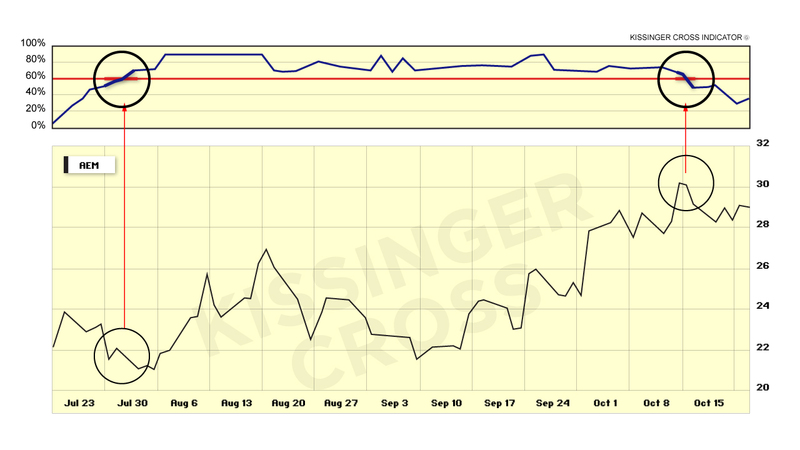 First, the Kissinger Cross indicator I’ve been showing you today. 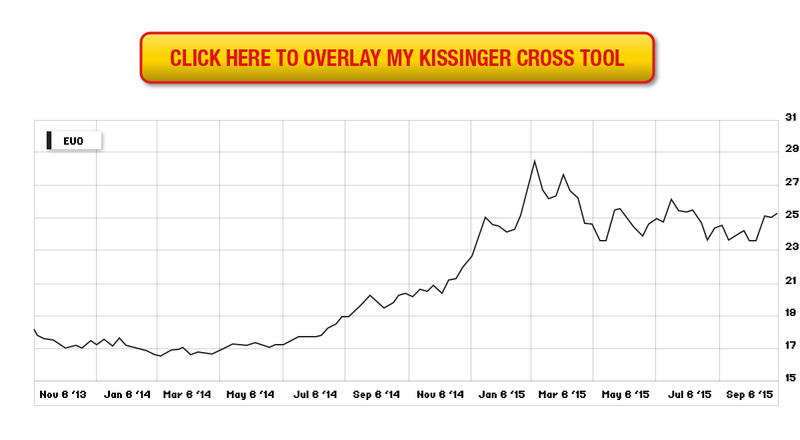 Second, a specific type of investment that the Kissinger Cross works best with. Used together, I believe this dual layer is safer than how most people trade stocks or bonds. That’s because the way I use the Kissinger Cross gives you embedded leverage. That means that every $1 you invest can return many, many times your money. In fact, your upside potential with this type of investment is unlimited. But your risk and downside is always known and limited. That’s the kind of risk/reward you want in an investment. Meanwhile, most investors continue using a traditional buy and hold method with stocks. That means they’re totally at the mercy of the wildly swinging up and down markets. But when you use the Kissinger Cross method I recommend you could be in and out with precision strike profits. 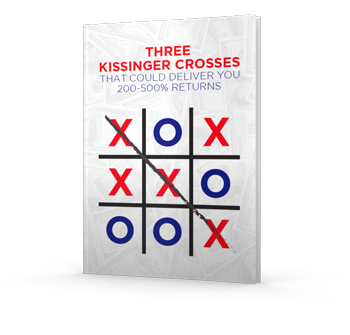 There are only a three things you’ll need today to begin using Kissinger Crosses for big gains. As I mentioned earlier, our beta-testing phase is complete -- proving once and for all that the system can work to spot real-time movements that could quickly double your money or more. That’s why I’ve decided to start a brand new research service called Jim Rickards’ Intelligence Triggers. To deliver a small, serious group of readers new Kissinger Cross triggers to your inbox as soon as they happen. STEP 2: Then, I’ll find the simplest way to play them for big gains. I’m talking about money making trading opportunities you won’t find anywhere else. STEP 3: Finally, I’ll send you emails -- sometimes as often as once a week, with the exact instructions on how to play these opportunities… the exact set-up, what trade to make, and when to get in and out safely and easily for the most gains. 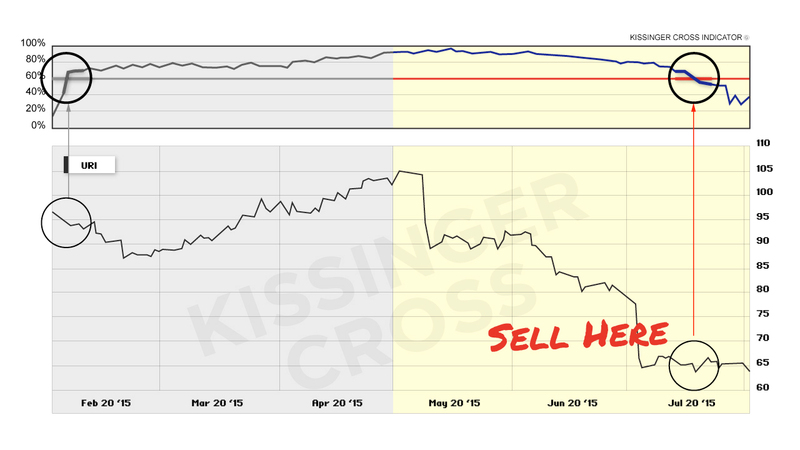 Before you get started, I’ll teach the basics you need to know about Kissinger Crosses… limiting your risk… executing the trades and monitoring their performance. Everything’s reserved for you inside your free copy of: The Kissinger Cross Handbook: How to Use Kissinger Crosses for Big Financial Gains. 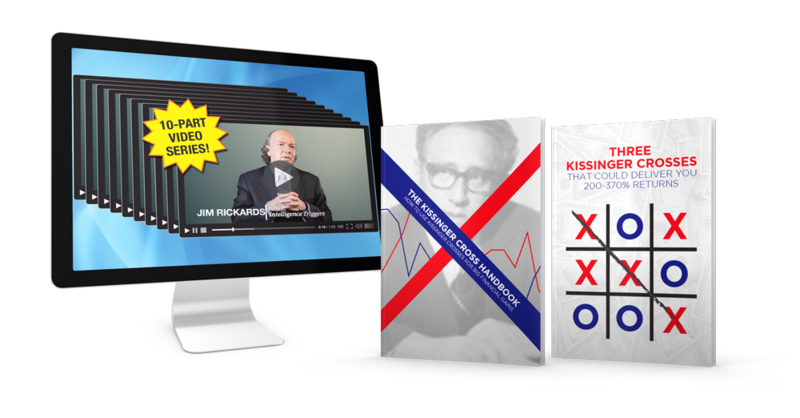 The full story of what Henry Kissinger taught me that day in 1981… the exact math formula that makes these crosses so statistically valid… how I’ve used it to help the U.S. government stop terrorists… how I’ve personally used it to build successful career in finance… and how you can use it for quick strike profits. So unlike other services that leave with you boring manuals to read, I’ve took everything to a whole new level and recorded a ten part video series explaining everything. When you claim your seat at the table with me today, I want you to make a point to watch a video a day for the first 10 days. Stick with the system and it’ll work. That’s why the video series is so important. Listen, I know I’ve thrown a lot of brand-new information at you today. That means you probably have some questions about how this all works. Myself and Milk it for Millions? The truth is, I have kept this secret to myself. And I have used it to make millions of dollars for myself over the course of my 34 years in law, government work and finance. But that hardly means I can’t show you how to use it too. Remember, according to my research we should see 20-30 Kissinger Cross setups each and every year. On average, that means I’ll be sending you a trading recommendation about every other week. And collect any gains that come your way. Remember, this method is so simple anyone can use it. And there will be no tests around the mathematical formula behind the Kissinger Cross. I’ll do all the analysis and overlaying for you. Think back to the example I showed you earlier. When it flashed a second time… you would’ve sold. Here you would have seen 1519% in just three months. Though every play may not yield quadruple digit gains, just a fraction of this every few months could build a fortune. We’ve specifically designed this for everyone to be able to use. Remember, it only takes as little as a few hundred dollars to get started. But if you want to play it safe, you could start out by making “paper trades”. When you do that, you can see if the trades are right for you without risking any money whatsoever. Of course the more money you put into a trade, the more you stand to make. You won’t see triple digit gains if you don’t risk some of your money in the market. That’s just the way it works. Truthfully, you could start raking in profits 30-90 days from now. This isn’t a buy, hold and hope strategy. 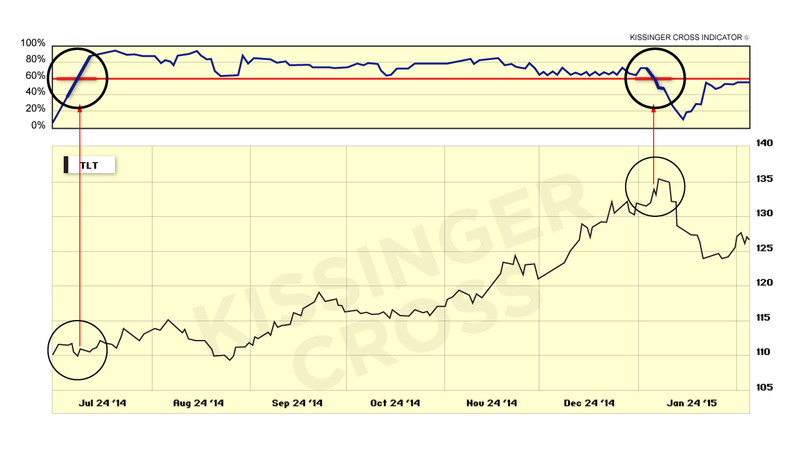 As I’ve been saying the Kissinger Cross is a trading breakthrough. The key word there is “trading,” not “investing. This is get in and cash out -- with the estimated profit periods ideally no longer than 90 days, max. As I’ve been mentioning, there’s a strict limit to new members. We’re taking just 200 per day. Because I made it very clear to my publisher that I wanted to provide hands on support for each and every member of my Rickards’ Intelligence Triggers service. If I’m going to put my name on something, I want it to be the best. To provide you with that ongoing support we’ve hired a full team of customer care associated to our Baltimore based offices. They’re standing by to answer your most pressing questions about your subscription benefits. Which, in turn, puts a strict limit on members we can take today. If you’re reading this right now, GOOD NEWS -- there’s a spot open and waiting for you. But if you fail to move quickly during these final steps, someone else may hop in your place. This offer may shut down. Perhaps for good. Ironically you can consider this moment right now as a Kissinger Cross moment of your own. You've watched this message today, so you've seen all my information and proof. So the flash point for you is right now. Will you seize opportunity and be rewarded? Or watch life -- and potential profits -- pass you by? I’m not trying to pressure you… but just tell you about the urgent opportunity sitting in front of you right now. Three Kissinger Crosses have recently triggered. These are now flashing “buy” on the screen in front of me. Any of the three could make you as much as 200-370% or more in 90 days or less, with less risk than simply buying and holding stocks. You could buy into all three once I hear from you today. You’ll be “in” the trade less than 15 minutes from now. I’ve covered all three of them in a second special report called, Three Kissinger Crosses that Could Deliver you 200-500% Returns. Like everything else I mentioned today, this special report is yours FREE when you join Rickards’ Intelligence Triggers today. 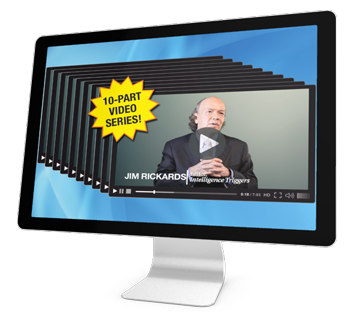 We’d like to extend to you an invitation to become a charter member of Jim Rickards’ Intelligence Triggers today — at a rate that’s much less than what we’ll ask everyone else to pay when this limited-time offer expires. Your Intelligence Triggers Kit and Video Series -- yours to keep no matter what. You get your first trading recommendations… with more to come (at least one recommendation every two weeks). Simply click the “Subscribe Now” button that you see below this letter now. Hitting this button does not obligate you to anything. You’ll just be directed to another page with additional information about this offer. Here is my guarantee: If for whatever reason you want to cancel your subscription in the first 60 days, just let us know by giving us a call or shooting us an email. We'll give you a prompt refund, no questions asked. All you’ll end up paying is a small 10% processing fee. We’ve simply poured too many resources into this project to let these deadbeats get away with that. This 10% fee protects the serious readers who choose to invest in Jim’s research, while also discouraging fraud. This checkout page has an order form that’s fast, safe and 100% secure. We are using the latest complex encryption technology we can find to protect your data though the entire ordering process. And I’ve given you a nearly risk-FREE way to try it all for yourself. Now the choice is yours whether you harness the power of the Kissinger Cross indicator. Are you still here? That’s okay. I understand you may still have some questions. And I’ll do my best to answer them right here so that you can feel 100 percent comfortable with your almost risk-free decision today. 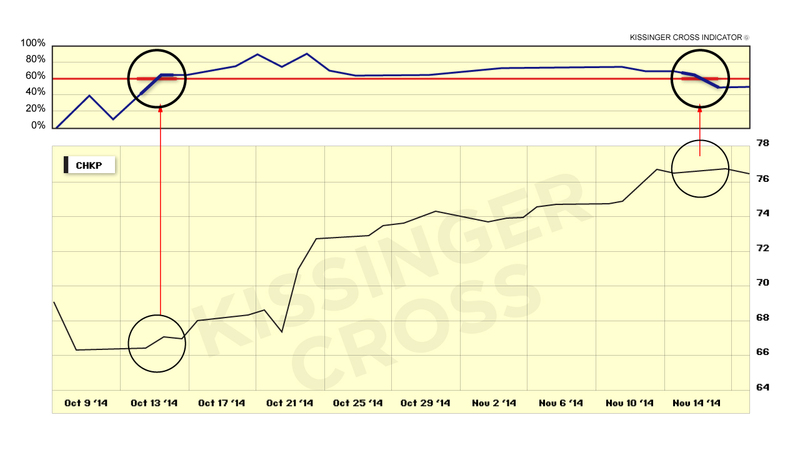 Answer: Believe it or not, but the Kissinger Cross works BETTER in periods of high volatility! If you remember, I already showed how you could have made as much as 1,508% as oil prices fell, thanks to the Kissinger Cross strategy. 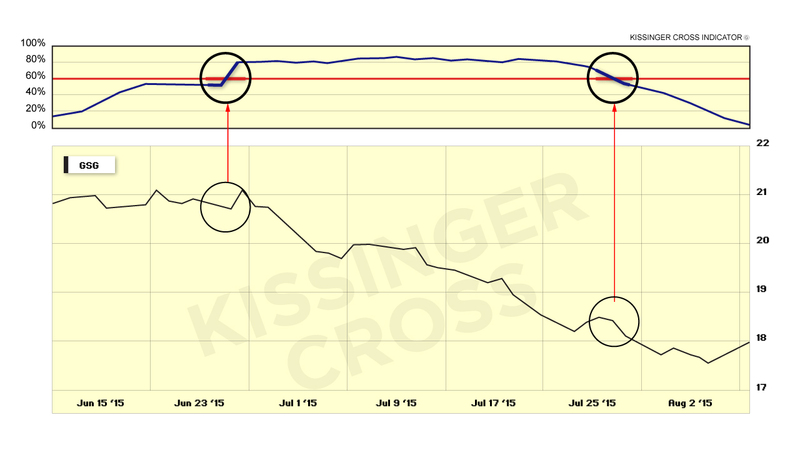 I would go as far as to suggest that if you are afraid of a stock market crash, then you simply MUST get your hands on the Kissinger Cross indicator. That’s because this crisscross can also unlock trade opportunities that can help you protect your portfolio from loss in the event of a crash. Don’t be stuck out there without having this powerful protective tool in your pocket! Click the “Subscribe Now” button to get started. Answer: You might already be familiar the IMPACT strategy, which he uses to profit from currency wars. So it’s natural to wonder how this Kissinger Cross strategy is different? I can tell you this: If you like my IMPACT System, then you will simply LOVE the Kissinger Cross and Rickards Intelligence Triggers. As you will see, the Kissinger Cross opens up even more creative trade opportunities. Including trading opportunities that have nothing to do with currency trading. 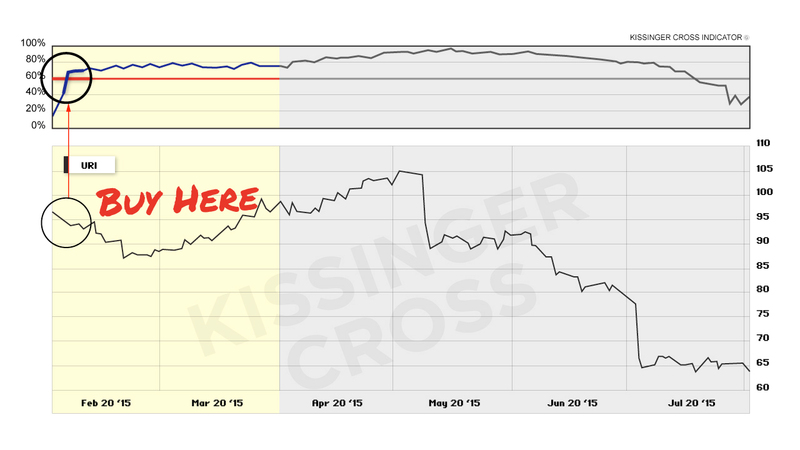 On the other hand, if you’ve never tried my IMPACT system – or if you had previously decided that currency trading wasn’t for you – then I think you will find that the Kissinger Cross is a more straightforward approach. 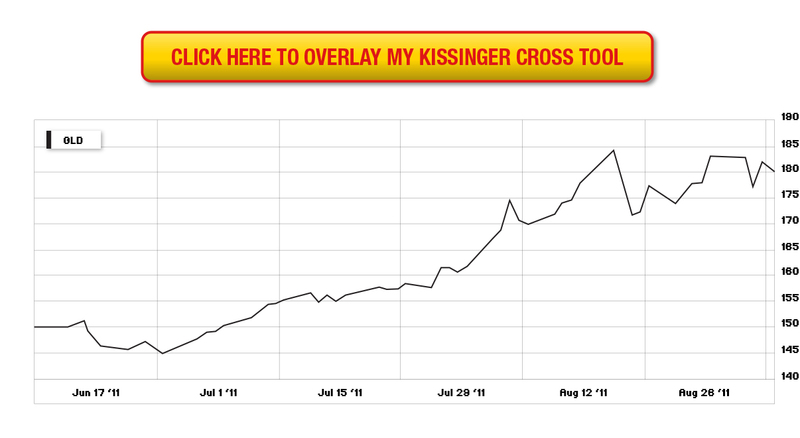 As I promised you today, all this Kissinger Cross does is open up new trading opportunities you’ve never seen before in a very simple way. Answer: It depends on the broker. If you have any investing experience, however, it’s very highly likely your broker will allow you to make these trades. Everything about setting up a brokerage account is covered in the Kissinger Cross Handbook, including information related to trading this strategy using your IRA. Answer: Congratulations. Skepticism is not only healthy, it’s the mark of a smart investors. You should investigate before you jump into anything. That’s why we are giving you 60 days to check out this opportunity. I want you to see firsthand — safely — that my Kissinger Cross strategy can make you money more safely than how most people trade stocks. Once you’ve studied it and you’re totally confident it works, you can start making money at your own comfortable pace. You have 60 days to test everything out, either with paper trading or with as much money as you want to risk. If you don’t get the results you want, just ask for a refund. What could be safer or easier than that? The only “catch” is that we will shut down this offer once we reach our limit of one in 100 subscribers (or 1% of our total readership). Remember, hitting this button does not obligate you to anything. You will simply be redirected to another page with additional information about this special offer. "Is This Too Difficult to Learn?" Answer: You’ll be wondering if you need to be a math-whiz to make this strategy work, or if it involves complicated formulas and the like. 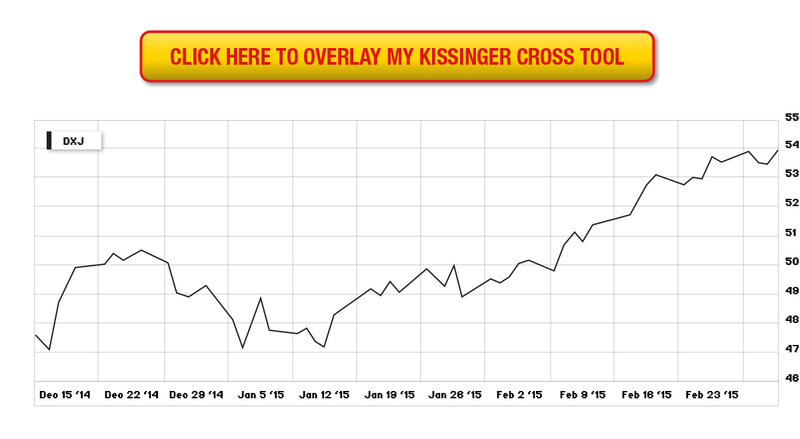 It is true that the Kissinger Cross indicator is based on the application of a powerful mathematical formula. However, if you use this research service as it is designed, it requires zero math skills to start making money. In fact, if you can add up 2 + 2 in your head, then I guarantee you can understand, and potentially profit, from this information. Of course, when you try out ANYTHING new (from riding a bike to buying your first stock)… it takes a little bit of practice at first to get it right. But we’ve tried to put everything you’d need to know in your free copy of the Kissinger Cross Handbook. Plus keep this in mind: There’s a phenomenon described by science as “the curse of knowledge.” It’s a cognitive bias that leads better-informed people to find it extremely difficult to think about problems from the perspective of lesser-informed people. That’s why you’ll often see “beginner’s luck” come into play. Because someone coming into something brand-new can still see all the angles — without the bias. Instead, you’ll be coming at this fresh and ready to see all the opportunities to make money, the very same way I look at these opportunities. Who knows? You might even get a taste of “beginners luck” that can not only give you back your money you pay for this service within a few short weeks, but possibly enough money to put you on the path to financial freedom that you deserve. But that’s only if you hit the “Subscribe Now” button right now and take advantage of this limited and generous Rickards Intelligence Triggers offer before we hit the 1% limit. Answer: I AM making this available to hedge funds. In fact, many hedge fund managers will likely see this offer. That’s the opportunity for you here. That is, if you are NOT a hedge fund manager or if you don’t work on Wall Street. In the past, some investors have paid more than $500,000 in order to participate in the Kissinger Cross secret. 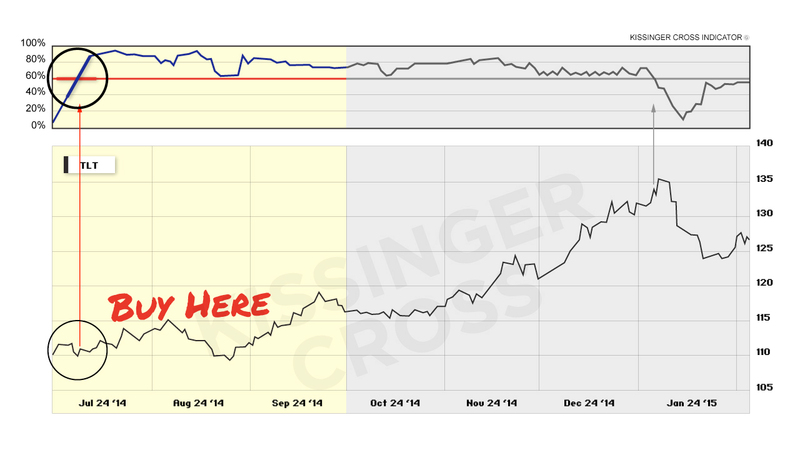 This is a HUGE concern for me and the few people who are using the Kissinger Cross indicator right now. The fact is, if too many people do find out about this, it is possible this would spoil the “profit party” for everyone. I would guess that even if you have zero trading experience, you can make the Kissinger Cross work for you in less than an hour per week. In short, this doesn’t take much time at all to use. That’s because the Kissinger Cross indicator I’ve been showing you shoulders most of the work. Then, at least once a month, I’ll email you a new trading recommendation. From there, it is up to you to decide if you want to make a trade – and how much of your capital you want to allocate to each trade. The fact is, if you know how I apply the math behind the Kissinger Cross indicator then maybe you don’t need my service. But that said, you can save yourself a lot of time and heartache by simply responding right now and getting your copy of the Kissinger Cross Handbook and seeing this strategy laid out step-by-step. We’ve already done the hard work for you in this handbook. You can try it out practically risk-free for 60 days. Just hit the “Subscribe Now” button for all the details. If you’ve ever traded stocks in your current brokerage account, then chances are you can use this Kissinger Cross strategy in your regular brokerage account with possibly a few minor modifications. The good news is that any modifications you might need to make are easy to make. Often times, they can be made using a quick email or phone call to your broker. It’s even possible to use this strategy using your IRA. There is no writing of options, as you’d need to do with strategies based on covered calls or selling naked puts. There is no shorting of stocks. It is not related Foreign Exchange (FOREX) trading, or Futures or Commodity Trading, either. 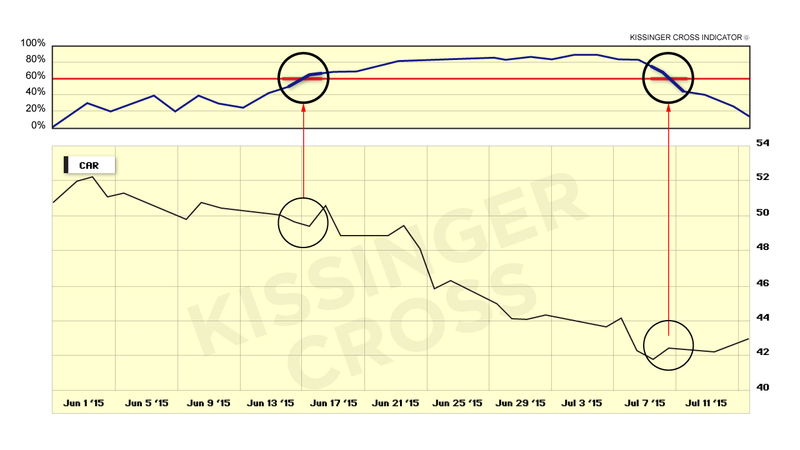 Using the Kissinger Cross indicator is a brand new strategy. But have no worries here. 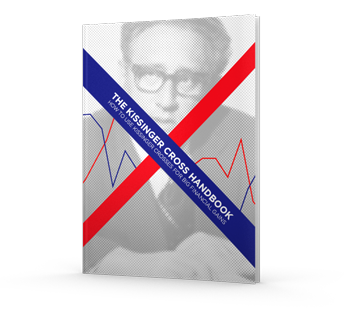 Because we’ll tell you exactly how to set up your brokerage account (or any brokerage account) to trade in your Kissinger Cross Handbook. The Kissinger Cross strategy is based on a mathematical formula. It’s been used (often in secret) for hundreds of years now. It’s helped predict and unlock complex human behaviors – from breaking the codes of enemy submarines… to influencing global policy… to helping the CIA pinpoint terrorist activities. I’ve discovered that this strategy is especially powerful when applied to a certain section of the options markets. But what I’ve discovered is NOT options trading like you’ve ever seen before. There is no writing of options, as you’d need to do with strategies based on covered calls or selling naked puts. This is not a complicated “advanced” options trading strategy. Instead, the Kissinger Cross strategy is about opening up simple and safe trade opportunities within the financial markets – including incredibly lucrative plays within the options market. You can find all the details by hitting the “Subscribe Now” button, including how you can get this research service for a significantly discounted price than what we plan to charge in the near future. Remember, hitting this “Subscribe Now” button does not obligate you to anything. Certainly. This is a great strategy to bring in extra income. Let’s say this strategy can get you 671% gains a month. What might that look like to your bank account? That would be average out to $20,130 for the year, or about $1,678 a month from your winners. For most people, that’s enough to fund your retirement or to serve as a nice second income stream. Or if you want, you can reinvest to multiply your wealth. The choice is entirely up to you. Because most investors use a buy and hold method. If you buy and hold, you are totally at the mercy of the markets. Whereas with this Kissinger Cross strategy, you will often only be in the markets for small increments of time, sometimes for as short as 30 to 90 days at a time. Your free copy of the Kissinger Cross Handbook will explain this concept further. But for now, understand that trading like this has the potential to reduce your risk exposure by 25 to 50% if used correctly. I have no idea! If anyone knows about this indicator, I’d be shocked if they are NOT using it to make a lot of money. 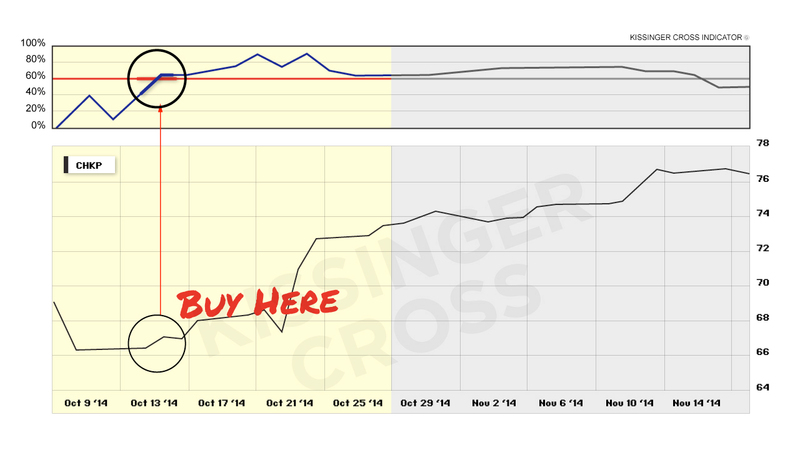 My guess is that everyone will want to trade using this Kissinger Cross indicator… once they discover its existence. That said, we are limiting the distribution of this secret to only 1% of our total readership. You can see the complete offer after you hit the “Subscribe Now” button right now… remember, space is limited, and you can try out everything for 60 days… and you won’t be obligated to do anything by hitting the button. I specifically designed this research service for people who want higher returns without high risk. It is a RISK-AVERSE strategy. Why? Because you don’t have to take open-ended risks. You don’t have to risk your money like most peopled do… putting 100% of their retirement money in the stock market constantly all 12 months a year — riding stocks up and down at the mercy of Wall Street, the economy… or worse, at the mercy of the Federal Reserve. The Kissinger Cross strategy is all about giving you the control over your money. This includes how much risk you want to take. The kind of plays you will see on Rickards Intelligence Triggers have built-in risk protection. But on the other hand, if you can’t tolerate ANY risk, then this may not be right for you. As with all investing strategies, there will be risk in our recommendations. You could be better off sticking with Treasuries and being happy with 1% to 2% returns. Only you know your own risk tolerance and what you’ll feel comfortable with. The choice is entirely up to you. No matter what, we want you to sleep soundly at night with your decision, which is why we give you our 60-day money-back guarantee. If you define it as the ability to make more money, so you can spend more constructive time with your family, go back to college, travel, give more to your church or charity and “be a better you” — then this very well could make you “rich,” indeed. 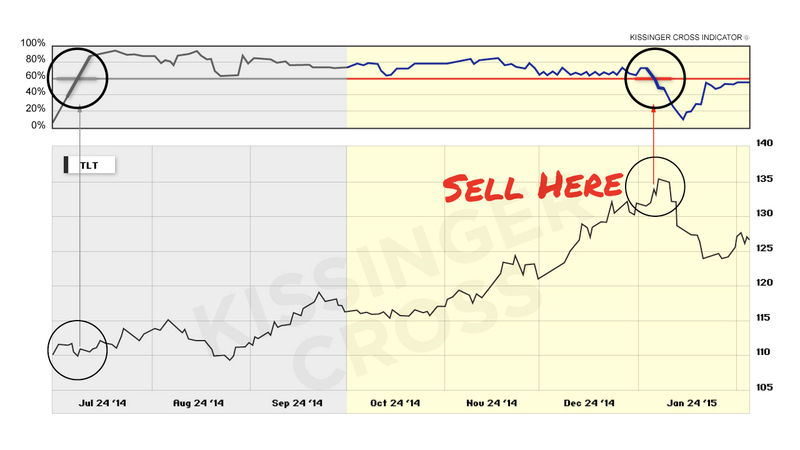 We believe the Kissinger Cross will make you money. That’s why we are offering it to you today with this special offer. And here’s a quick piece of advice: When you start using this research service, I’d encourage you to write down goals of how much you want to make in the next 12 months. Then decide how much to allocate to reach your financial goals. I truly believe that if you use the strategy correctly… you will be pleasantly surprised how quickly you can reach whatever financial goals you set. This is NOT a “get rich quick” gimmick. Here at Agora Financial, we’re in the business of sharing ideas and actionable research that can help you thrive in any type of market. If we published foolish or dishonest material — we'd be out of business. No. There is no technical analysis that you’ll have to perform. All you need to know is the specific play, and when to get in and when to get out – at each Kissinger Cross. My team and I do all the hard work for you. Each alert will tell you exactly what to do. You just have to decide whether you want to follow what we recommend! We don’t agree it is “impossible” to beat the market. First off, we all know it’s possible to beat the market. You and I could name several famous investors who beat the market all the time. Second, I showed you today how gains as much as 600% to 1,000% are possible. We’ve tried to show you all the proof here in this message. It is entirely up to you if you believe our research or not. But whatever you decide, you’re still covered by our 60-day guarantee. Just hit the “Subscribe Now” button now. Hitting this button does not obligate you to anything. You’ll just be directed to another page with additional information about this offer. YES, anyone can learn to do this. Especially you. Why? Because I designed service specifically for YOU. For a regular American with an average understanding of the markets who want to better their financial circumstances, who now can thanks to the application of the Kissinger Cross indicator. Don’t wait until it’s too late. Hit the “Subscribe Now” button and take advantage of this limited-time offer to while you still can. You won’t be obligated to do anything by clicking this button. You’ll just be sent to another page with more information on this special offer. To be completely honest, if you choose NOT to invest in the Kissinger Cross recommendations — then I can guarantee with certainty that you will not make any money on them — and this service will be nothing more than education. But I do guarantee this service for a full 60-day period. And during that time, if you’re skeptical, which is completely understandable, then please do feel free to paper trade. By paper trading, you can accomplish two things: First, you won’t risk a single penny. Second, you can prove to yourself that this is the real deal. And if for any reason (or no reason at all) you decide you made a mistake in the first 60 days, just let us know by giving us a call or shooting us an email. We'll give you a refund, no questions asked. All you’ll end up paying is a small 10% processing fee. Nothing ventured, nothing gained! I can guarantee your satisfaction with a 60-day money-back guarantee. Bottom line, we all want you to be successful and to move forward with piece of mind. That said, we only want people who are serious about learning how to make money using this strategy. That’s why only one in 100 of our readers will get in (it’s first come, first served). If you are still seeing this message then there are still openings to join. But only if you hit the “Subscribe Now” button and take advantage of this limited-time offer. That said, if you want to make actual money you can spend (or reinvest), then yes, you’ll need a little money to get started. How much is up to you. You can get started with as little as a few hundred dollars to invest. But remember, once we hit our limit of one in 100 readers, this offer will shut down. Don’t wait until it’s too late. Hit the “Subscribe Now” button and take advantage of this limited and generous offer to while you still can. Absolutely. Immediately after joining, we will give you a special customer service number that you can call with any questions you might have about how your membership works and what you’re entitled to. You’ll also get a special email address for the same purposes. This is exactly why we are limiting this offer to the first 1% readers who respond. We don’t outsource our calls overseas. We want charter members of Jim Rickards’ Rickards Intelligence Triggers to experience the world-class service they deserve. Within 10 minutes of responding today, you can download everything right on your computer, phone, tablet or other device. Just click the button now to get started. I plan to make at least one trading recommendation per month. This number can easily increase based on what the Kissinger Cross is opening up thanks to the recent increased market volatility. Once you click the “Subscribe Now” link, you’ll get a chance to review everything before anything is processed. After you have used the same secure order form, you’ll be able to download the reports immediately as Adobe Acrobat PDF files. Remember, you must act now to avoid getting locked out. Once we hit 1% of Agora Financial’s readership, then that’s it. This special offer will be closed. The choice is completely up to you, but I highly suggest you hit the “Subscribe Now” button now, so you can decide with all the remaining details of this offer. You won’t be obligated to anything by clicking this button — you’ll just be sent to another page with more information on this special offer. Thank you for your time, and I hope to see you on the other side! You can still click the button as long as you remain on this page.